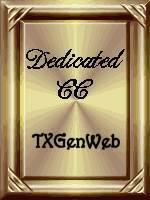 My name is Raynell Morris, I am descended from the daughter of Timothy T. Griffin and Frances Viola Elliott. In a passage from the book written by Charles S. McClesky "A Short History of the Patilo Community of Erath County Texas" it mentions that Timothy is buried in the Bosley Cemetery which you have him listed as. 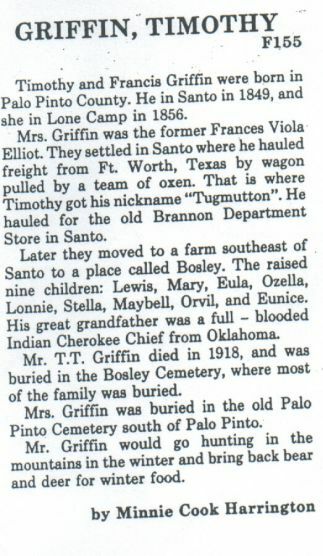 It also mentions that Frances is buried in the Old Palo Pinto Cemetery. She is not listed there. How can I get her name listed as buried in that cemetery? Here is a copy of the passage. She was born in 1856, I don't know when she died. Note: The only Griffin shown in the Bosley Cemetery is Ethel Griffin born 1901 died 1902. She was the daughter of T. T. & M. E. Griffin. So apparently Mrs. Frances Griffin died before 1901 and Mr. T. T. Griffin remarried a lady with the initials M. E.
Anyone with information about this family is encouraged to write to Rayn Morris at the address shown above.